The pace of agency review activity, already more hectic in recent years, is gathering even more momentum. A new study has found that nearly 75% of major multinationals are reviewing their current agency arrangements, looking at whether they have the right mix of agencies and capabilities on their rosters. The study, titled “The Future of Agency Rosters” is from the WFA and The Observatory International and has found that many clients have concluded that their current roster set up is not working effectively. Based on a scale of 1 to 10 clients gave an average effectiveness rating for their agency roster of just 5.7. Agencies aren’t thrilled with the effectiveness of current rosters either, per the study. 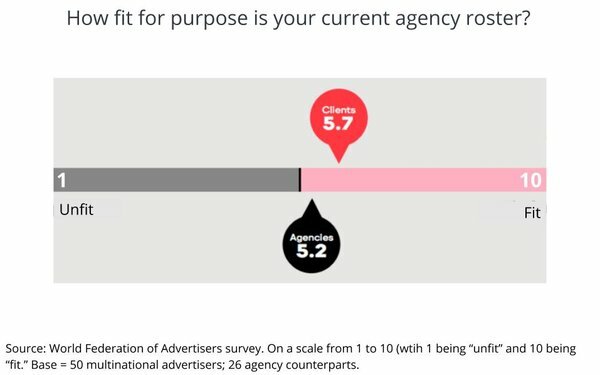 The average effectiveness rating from the agency side was an even lower 5.2 out of 10. The findings are based on responses from 50 multinational marketers representing total global ad spend in excess of $69 billion. Twenty-six agency representatives contributed, with more than 50% in global/regional roles and the balance evenly spread across the globe. The current dominant model of agency management is “multiple agencies managed individually by marketing” (81%). That’s followed by “integrated lead agency” (44%) and “network agency with specialists from same holding company” (39%). However, many advertisers use a variety of core models across their operations, underlining the complexities of developing “fit-for-purpose” roster architectures around the globe, per the report. Nearly 60% of the marketers polled said they were looking to reduce the numbers of agencies on their roster over time. But over half said they intended to add specialist shops. The good news for agencies is that 82% per cent of advertisers do not foresee a world without agencies. Agencies feel that clients do not provide them with the right tools to deliver expected results and thus work is undermined. Collaboration can be hindered by internal structures (51%), poor quality briefings (49%), approvals and sign-off processes (40%), lack of trained client personnel (40%) as well as lack of a clear data strategy (52%). Clients agree and nearly 50% recognized that their own internal structures may be an encumbrance to operating the most effective roster model. Eighty-four percent of clients also believe that agencies are struggling with MarTech (71% of agencies agree) underscoring the complexities of the marketing and ad-tech space and the reason why management consultants have succeeded in providing added competition to agencies. 1 comment about "Report: 75% Of Multinational Marketers Are Reviewing Agency Rosters". Ed Papazian from Media Dynamics Inc, June 12, 2018 at 10:14 a.m.
A good, well balanced report, Steve. It's a fact that many of the agency ills that are harped on by agency bashers are, at least partly caused by the outmoded ways that advertisers are organized, how well they inform or direct their agencies and how they percieve their roles as "clients" rather than as "partners".